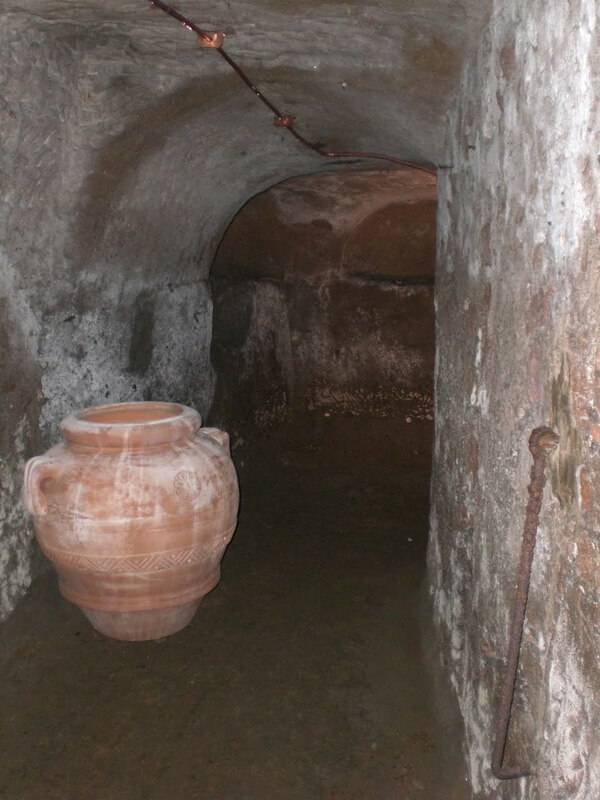 The catacombs beneath Villa Taverna. Once a year, the CLO holds an auction to raise money to support its budget. Various goods and services are donated and the auction takes place on a Saturday night in late Spring. It’s a dress up affair with an open bar. The ‘dress up’ part isn’t as important to the story as is the ‘open bar’ part. […]Dave and Stacie had just won the Wine Tasting Event. “Great,” I said. “Count me in. How many of us are there?” He explained that, including me, there were already three of us. “But,” he said, “this includes dinner too!” 400 euros to spit wine into a bucket and eat fingerfood was a deal I couldn’t pass up. The Wine Tasting Event was held at the Ambassador’s residence, Villa Taverna, in a wine cellar designed and built by his predecessor. To get to the small elegant wine tasting room, we walked through ancient Roman catacombs that were only discovered during the construction of the wine cellar. We were served four white wines and four red wines by a sommelier who had personally chosen them from Villa Taverna’s 5,000 bottle collection. He explained what we might be experiencing with each vintage and asked us to tell him what we thought of each one. I thought that one eighty euro bottle of red was just fine, and said so. Each of us was asked which of the eight wines we preferred to have during dinner and everyone was given his or her choice. “Gimme that 80 euro red,” I said sophisticatedly. The food was every bit as good as the wine and I barely saved room for coffee and dessert. As we were departing late in the evening, the sommelier mentioned to us that we were the first people to use the wine tasting room. I’ll be more than happy to join any future groups planning to take advantage of this opportunity and our bidding strategy will begin with an open bar. As the former U.S. ambassador to Kenya in 1998, I can only shake my head in sorrowful frustration at the reports about our intelligence community coming out of the Washington Post. At the time our embassy was blown up, the intelligence community was small indeed by today’s standards. Small enough to be competently led. It was not. Notwithstanding a secret Grand Jury indictment of bin Laden, the National Security Agency intercepts of his communications, the scrutiny of the bin Laden-focused Alec Station at the CIA, the investigations of the FBI’s I-49 squad, repeated tactical warnings, and my own two-year efforts to bring attention to our embassy’s vulnerabilities, the intel/law enforcement/policy community was unable to prevent the first two, soon forgotten, attacks on the United States by al-Qaeda. 2. Yes, the embassy was located in the city that housed the well-known and long-established al Qaeda East Africa military cell, but birds do not foul their nests…or whatever the metaphor. 3. Yes, Ambassador Bushnell and then-Commander of the U.S. Central Command, General Zinni, had communicated their security concerns about the embassy, but they were merely field professionals, “civilians,” to the intel/law enforcement/political community of the time. 4. Yes, an intercepted letter from an al Qaeda gang-banger in 1997 indicated the presence of “brothers and engineers” in Mombasa, Kenya but the Nairobi cell had been “disrupted” following a CIA-FBI-Kenyan team raid that same year, so that was that. 6. And, yes, the Ambassador had defied the system to write a personal letter to the Secretary of State after being reprimanded for “overloading the circuits” about her security concerns, but there was no money and, anyway, the “experts” in Washington said the Nairobi terrorist threat was only medium. 7. No, none of the secret information about al Qaeda known in Washington by the CIA, the FBI, the NSA, the Department of State, the Department of Defense, and the White House NSC was ever discussed with anyone at the Nairobi embassy – or any other embassy for that matter. Nor were pertinent facts held by the federal prosecutors in the South District of New York who were covertly trying to bring bin Laden to trial for his activities in Somalia in 1993. Why? The information was classified and compartmentalized. 8. Yes, the U.S. Embassy in Nairobi was blown up and so was the one in Tanzania… and that was a shame, but it did happen at the peak of the Monica Lewinsky scandal, so no, nothing much changed as a result. Instead, after the debacle of September 11, 2001, Planet Washington declared war on these Islamist gang-bangers and threw money, people, arms, secrecy, constitutional infringements and a perpetual state of Orange at the problems they were creating. The lessons my colleagues and I learned — as targets and survivors of an al Qaeda attack, foreign affairs professionals and leadership practitioners — were never sought. Video of the hearing (livestream) and prepared statements are posted here as soon as they are available. Video of the hearings (livestream) and prepared statements of the nominees are posted here as soon as they are available.